FREDERICK, MD- A close contest fell out of reach for the Frederick Keys (1-5) after the Fayetteville Woodpeckers (2-3) scored five runs in the ninth inning to win a 7-2 game on Tuesday night at Nymeo Field. Chandler Taylor hit the go-ahead home run and the Woodpeckers lineup brought home four more on run-scoring singles. Mason McCoy 's single scored the Keys pair of runs while J.C. Escarra added two hits. Fayetteville took an early 1-0 lead on Taylor's RBI single in the second inning and added another run on Seth Beer's sacrifice fly in the third to make it 2-0. McCoy answered in the fifth inning and singled home two runs to tie the game at 2-2. The Keys had the first two runners reach in the sixth inning but failed to score them after retiring in order. Keys starter Brenan Hanifee scattered five hits and three walks while inducing three double-plays over five innings. Francisco Jimenez delivered a solid performance in relief, throwing three scoreless innings. Diogenes Almengo (1-1) was dealt the loss after allowing five runs in the final frame. Woodpeckers' starter Bryan Abreu struck out seven while allowing two runs over five innings. Cristian Javier (1-0) pitched four scoreless frames and struck out seven. 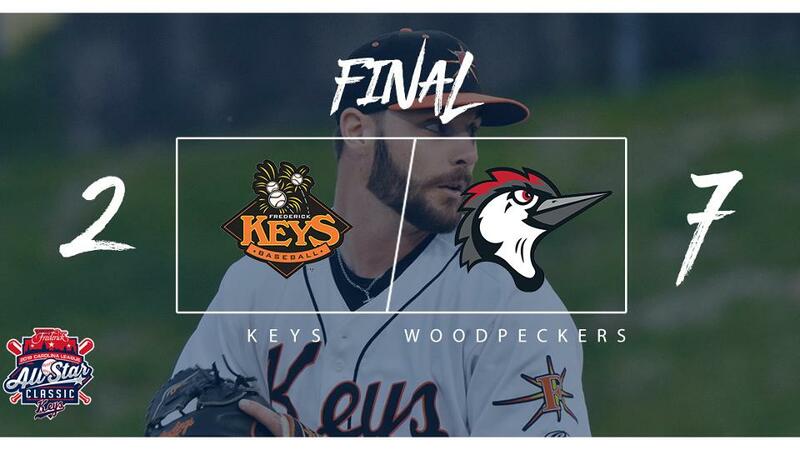 The Keys and Woodpeckers will finish the three-game series on Wednesday, April 10 with first pitch scheduled for 7pm. The Keys have yet to name a starter while the Woodpeckers send LHP Parker Mushinski (0-0, --) to the mound. Pregame coverage begins at 6:45 p.m. on frederickkeys.com and the TuneIn radio app. For a complete look at the 2019 Keys promotional schedule fans can visit frederickkeys.com.